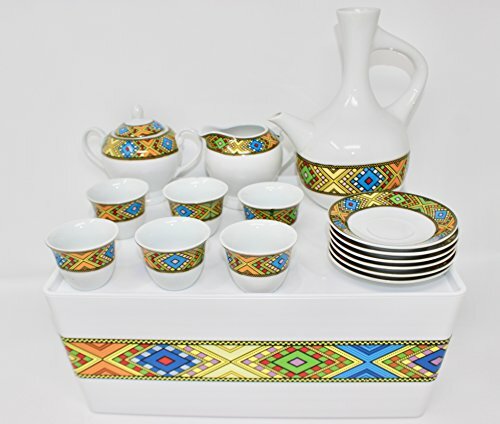 Introducing a full set of Tilét Edition Ethiopian Coffee Cups ፪ with Rékébot ረከቦት ( Coffee Tray/Coffee Table). The set comes with 6 coffee cups and saucer, 1 Creamer, 1 sugar bowl, 1 coffee pot and Rékébot (Mini Coffee Table). Product Care: *In order to protect the artwork, do not microwave the coffee set. *Do not immerse the ረከቦት-Rékébot in the water. To clean the artwork use damp towel and simply wipe it horizontally. The top part/tray can be washed and it is waterproof. Color: Base color white, Mixed color art image. If you have any questions about this product by EthioDesigns, contact us by completing and submitting the form below. If you are looking for a specif part number, please include it with your message.